You’ll hear that chant soon enough! Those costumed tykes will be knocking on your doors this evening. What’s in? Princesses with their tiaras top the list. Getting all dolled up like the popular Disney royals rules the throne. It’s no surprise that little boys favor the action heroes, ninja warriors and Angry Birds. Here’s an easy recipe for that DIY Halloween treat adapted from the Food Network Magazine. 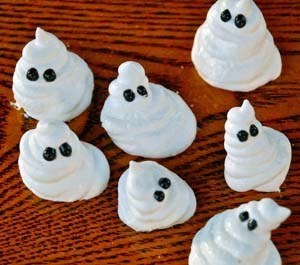 What could be more unexpected than Ghastly Meringues? Preheat oven to 200 degrees F. Line a baking sheet with parchment paper. Beat egg whites (at room temp) and cream of tartar in large mixing bowl on medium until frothy. Beat in sugar; increase speed to high and beat until still peaks form, 5-6 minutes. Transfer to pastry bag filled with large round tip. Pipe about 8 swirls on baking sheet. Bake until dry, 1 hour to 1 hour and 15 minutes. Transfer baking sheet to a rack and let cool. Dot on black eyes using gel (recipe called for melted chocolate chips but this is easier). Cool completely. Touch of Nature is the place to get into that holiday spirit. Look for gifts in every nook and cranny and one-of-a-kind decorations to deck your halls. Open house is held the first two weekends in November. On Saturday, the WLA United Methodist Church members and friends host their holiday boutique. Featured goodies-to-go include homemade takuan and chirashi. 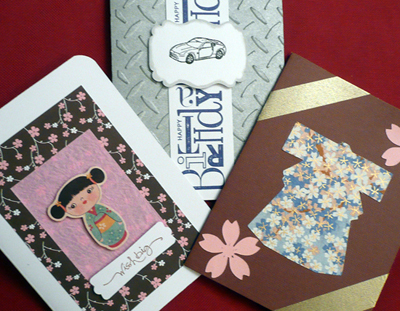 Shop for gifts made with paper, quilts plus jackets and bags with that Asian flair. Peruse the country store for old and new collectibles. The Kiku Craft and Food Fair held at the East San Gabriel Valley Japanese Community Center is one of the few events where you can chow down and walk it off as you go shopping. 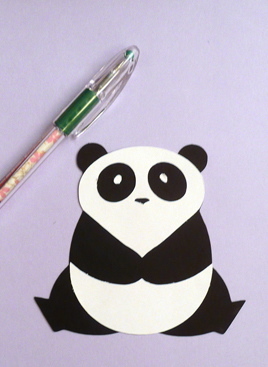 Move over Hallmark, here’s new vendor Stephanie Tsukamoto with her specialty paper crafts. Taking inspiration from two aunties, Tsukamoto named her company Katymarie Creations to honor them. One was a creative scrapbooker, the other a painter of flora and landscapes. “The desire to start crafting developed from watching my mom and auntie put together beautiful family scrapbooks,” she said. Tsukamoto branched off to make other paper craft items, like journals and planners. An HR analyst by day, Tsukamoto checks out card- making magazines and blogs to keep abreast of the latest trends for her two-year-old company. If you’re interested in paper crafting, Amazon offers a wealth of resources, samples, tools, techniques and tips. LIKE The Rafu on Facebook to keep up with Krafty Korner. Saturday, Nov. 3, 10 a.m.-3 p.m.